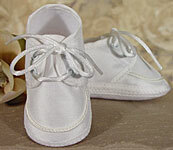 Elegantly masculine silk dupioni boys heirloom christening outfit with pin tucked lattice & buttons. Includes matching captain style hat. 100% Silk. 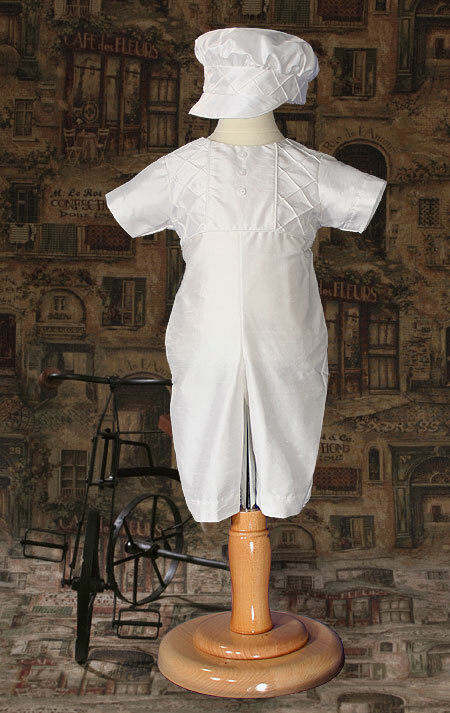 (Please note that all natural silk fabrics have slubs which are an inherent part of the fibers. These should not be mistaken for flaws in the fabric.) Dry clean. Hand made in the U.S.A. Shipped with elegant padded hanger and zippered vinyl bag. Heirloom Preservation Bag recommended for long term storage. 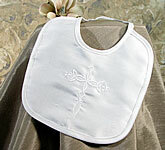 Champaign (slightly off white) Silk Dupioni bib with embroidered cross.